BeeBIT e.V. is a Germany-based association which focused on the research of bees by creating a network of sensor-augmented beehives all over Europe. Based on the collected data, learning materials for teachers and students are provided for free. Learn more about the association here. If you wish to contact us, please fill out this e-mail form. We are always looking for contributors, interested persons, institutions and potential supporters. 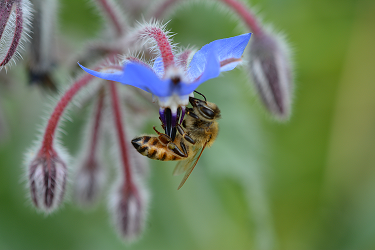 A bee collecting nectar while pollenating a flower. In recent years, the death of a growing number of bee colonies gained public attention almost each year. In order to understand the complex ecosystem inside a beehive, beekeepers and scientists need to collect data at first hand. Of course, monitoring and analysing is just the first step. At least as important as observing is to take action by sensibilising the public, especially young people who will shape our way of thinking and deciding in the future. Our so called eHive project tries to merge both approaches. An eHive consists of a wooden beehive equiped with six temperature and one humidity sensor. A scale measures the hive's weight. Environment data is collected by an included weather station. The picture above shows two temperature sensors getting clasped around by growing honeycombs. The figure on the right shows a CAD model of an eHive. 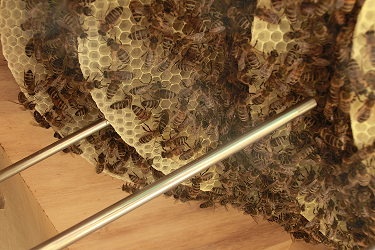 There you can see the hive inside an outer weather protection box. Under the hive a scale is mounted, on the upper right corner the junction box can be seen. Inside the hive three of six temperature sensors and the humidity sensor are shown. 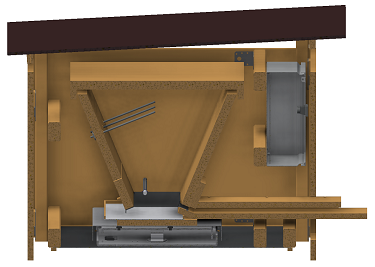 Cut through the CAD model of an eHive, side view. 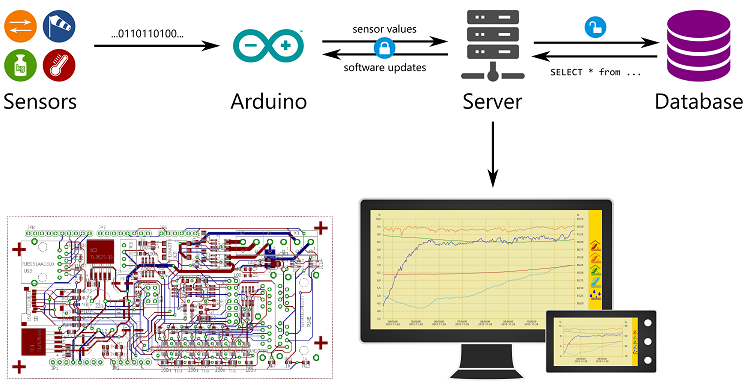 The sensors are read out by an Arduino and the collected data is sent to a server that stores the data inside a database. For easy visualisation, a diagram viewer was developed. Learning materials for teachers and students based on the collected data are provided for free and cover all natural sciences from math over physics, chemistry and geography to biology. The materials are available in seven european languanges and are applicable for all levels of education from early childhood up to graduation. More information about the project and how to participate in it can be found here. Data flow from the sensors inside an eHive to your screen. In the lower left corner the layout of the self-developed circuit board is shown. Here you find a table and a bit of information on why not all eHives send data.